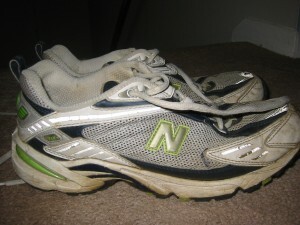 An old pair of my New Balance shoes, now retired to the role of gardening shoes. I believe my first pair of “running shoes” was a pair of retired volleyball shoes that I used in college until they wore thin. Once I realized the value of actual running shoes I dabbled a bit with different brands. I started with Saucony and switched to New Balance, then ran in Nikes, and moved around between the three brands for a while. Most of my purchase decisions were entirely based on price. I had no knowledge base of how a shoe should fit when I was first buying running shoes. A couple years ago, however, I started to really care about the shoes I was putting on my feet. I’ve had my share of blisters in every shoe imaginable from running shoes to high heels to flip flops so I often figure blisters are just part of the deal. After the Annapolis 10-mile run one year, I took my shoes off to find that my big toe had much more than a blister. My poor toe was bleeding, discolored, and looked just awful; it was the first time I’d seen my feet really take a beating from running. When I commiserated about this with friends, they instantly pointed to my shoes as being the culprit. They were not sized right for the amount of running I was doing and the A10 was the long run that finally took its toll on my feet. It was time for a new pair of shoes. At the local Fleet Feet I was properly sized for the first time ever. I had no idea there was more to being sized than simply measuring the length of one’s foot and identifying an arch type. I tried on shoe after shoe after shoe noticing things I’d never paid attention to before: where the laces tied, how tight the show fit at the front of my foot, where the tongue hit my ankle, the weight of the shoe, amount of cushion, bounce, and resistance, overall comfort, breathability. The store let me run around the parking lot in the shoes I liked best so I could determine what might be the best shoe for me. 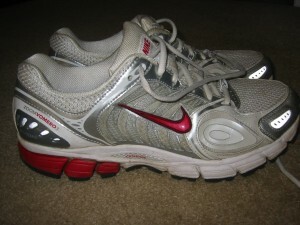 My Nike Zoom Airs which I now use for treadmill work, walking, or biking. I realized at the beginning of this process that it was no longer about price or color but about the best possible fit. Finally, I settled on a pair of Nike Zoom Airs. The shoes had bright red design elements to them along with silver reflective parts that I felt just screamed, “hey, look at my feet!” but I soon learned to love the style. I have longed to be a size 7 when it comes to shoes but I’m nearly always in a size 9. Not with the running shoes, nope. I had to buy a big old size 10 to give my toes the room they had long needed. While I loved my Sauconys and my New Balance shoes, I would classify the Nikes as my first “real running shoes” simply because they fit me correctly. I used them in my favorite 10K in Charleston, SC and in training for my first half marathon last fall. I ran in them all winter and into the beginning of the training for my first marathon in March. It was about that time that I realized they had gone way past their mileage life and I was due for a new pair of shoes. I’d gotten so comfortable in them that I couldn’t imagine wearing another type of shoe. I’m also not a great shopper and prefer the buying process to be as simple as possible. So I trekked back into Fleet Feet to order another pair of the exact same shoes. The Nike Zoom Vomeros near the end of their running mileage. What will replace them? I learned that Nike had renamed them to the new Zoom Vomero and while I think there was some “shoe engineering” that had been done to that style, I couldn’t tell. They fit fantastic and even felt a little better than my first pair. We’ve had a lot of good runs together and I know that their mileage life will be running out soon. When it’s time to replace them, however, I think I’ll be ready for change. I’d at least like to go through the fitting process again and see if there is something new on the market that will work best for my feet. I’ve dutifully read the shoe reviews in Runner’s World and will continue to do my research. As a matter of fact, this week I will accompany a girlfriend to a running store for her fitting and new shoe purchase process. When the time comes, I really look forward to finding out what my new shoes will be…my old faithful Nikes? The Sauconys or New Balance from my early running days? Or shoes I have yet to get to know, like Adidas, Brooks, or Mizunos? What do you wear? What shoe do you love? 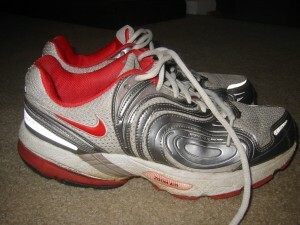 This entry was posted in Running and tagged 10K, New Balance, Nikes, Running, Saucony, shoes on June 22, 2009 by Natalie.